West Brom goalkeeper Ben Foster could be in line for a return to the first team on Saturday, after stepping up his recovery from a knee injury. The 32-year-old played 45 minutes for the Baggies' under-21s on Tuesday. 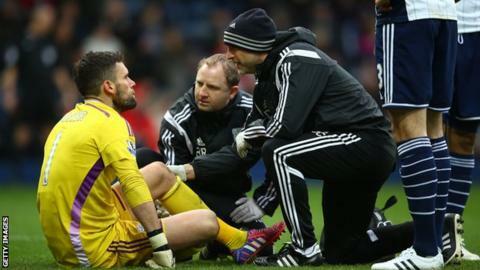 Foster has been out since March 2015 after damaging cruciate knee ligaments against Stoke. But manager Tony Pulis hinted the England keeper could be involved in Saturday's FA Cup third-round tie against Bristol City. Pulis said: "It's good to have Ben back. He played 45 minutes and then trained with us. "I will speak with the medical staff but I would like to think he might be involved in Saturday's FA Cup game." West Brom had hoped he would return by December, but he suffered a minor setback in October which delayed his recovery. Boaz Myhill has replaced Foster in his absence and has kept seven clean sheets this season while Anders Lindegaard was also signed from Manchester United in the summer. Foster, who has eight England caps, has previously spoken of his desire to return for Albion to try to force his way back into the England squad ahead of the European Championships this summer. In Foster's absence, Burnley's Tom Heaton and Stoke's Jack Butland have broken into the England squad as rivals to Manchester City's Joe Hart.